In November 2015 I visited Florida again, like I usually do. I posted twice about it - once about Miami and again about the sweet little key deer. I promised you way back on February 12th that I'd post more about Dry Tortugas National Park "in a week." Oops. I do want to share with you though so today I finally created a short series of images from my day trip to the Dry Tortugas National Park. I'm not going to tell you the history of Fort Jefferson, or of the park, you can read more expert info on other websites. I am going to share a little bit about my visit there and some thoughts on planning your day trip. In Key West, I normally stay at Eden House. The ferry terminal is just a few blocks away so all I had to do was roll out of bed, slather on sunscreen and walk over there. It's a pretty early start so if you're not a morning person, this might be the tough bit for you. Our morning was dark and cloudy but there was a beautful rainbow over the marina and that perked me right up. Having never been to the Dry Tortugas before, I read the ferry website multiple times to be sure that once I was on the boat and then on the island, I'd be prepared to enjoy myself. It's a long day, and it can be cold and windy on the ferry - as well as sunny - so I wore a tank top with a long sleeve white linen tee over it, a voluminous light-weight scarf, pants from Lucy, comfy flip flops, sunglasses and a crushable straw fedora. It sounds like a lot of clothes but all were light-weight, quick-dry and protected me from both sun and wind. Some of the other women on the ferry had on very pretty sundresses. They were very chilly. Take my advice and wear light-weight layers. A quick-dry ball cap-style hat that I can swim in and that stays on my head better than my straw fedora in windy situations. Sunscreen, lipstick, powder, a comb and Advil. My Canon 7D Mark II, my 24-105, my 70-200, 2 polarizers, an extra battery, an extra CF card, my rocket blower and a microfiber cleaning cloth, all tucked inside a small dry sack that fit into my day bag. My goal was not to have too much to carry around or to have to worry about being stolen while I was swimming. I did have the right things with me but it turned out, I didn't need to worry too much about safety. Everyone arrives and departs by the same boat. It's also not a big island so it would have been fine if I'd brought a great big beach towel instead of my skimpy microfiber one. I didn't bring any food with me because the cost of your ferry ticket includes a generous breakfast and a generous lunch, including water, coffee, soda etc. You won't go hungry on this trip. There's a little cash bar on board the ferry too. That opens about 2:00PM and it makes for a fine ride home to sip a margarita or beer as you head back to Key West. The one thing the price of your ticket notably doesn't include is bonine or dramamine but they offer it for a dollar a dose. If you're remotely concerned about seasickness, it's worth taking it. Your ferry ticket also includes the use of changing rooms, freshwater showers, on-board bathrooms, snorkeling gear and a tour of the island. The cost of the whole day, per person, is about $150. You can also fly to the island (which is a lot more expensive). If you want to camp overnight, you can do that too. You take the ferry in one day, camp for a few days, and then take the ferry back. I'm not much of a camper anymore but if you wanted to get sunrise and sunset pictures, it might be worth it to spend a night or two in a sandy tent. There's a certain calmness that comes from being on the water for several hours to get to your destination (and I'm certain the bonine helped with that , in my case). As we arrived, a lot of people stood at the rail at the front of the ferry, watching the approach to the island. When we docked, we were lucky to see a one of the planes land too, and pull up to the beach.. I'm one of those people that always has my camera at hand and ready to shoot, especially when I'm traveling. It doesn't matter to me anymore if it's "the wrong time of day" because traveling is about experiences and learning - and enjoyment! - not just getting up at dawn to chase the light. You might have noticed in the list of camera gear above that I had two polarizers with me. One is a standard polarizer, great for saturating blues and greens and reducing glare. The other is the very special Singh Ray Gold-n-Blue polarizer. As you shoot, you turn it in one direction to shift your color palette to gold and the other way to shift your color palette to blue. You'll also see a lot of purple tones show up in your images. You have to be a touch careful when you use it because if you go too far, you can't easily fix it in post. When you get it right, it's gorgeous. It's especially helpful in broad daylight, since it adds back in some of the nuances you would get shooting at dusk or dawn. When I use my Gold-n-Blue, I usually shoot the same image more than once, adjusting the filter as I go, to sort of hedge my bets. I made the image below just a few minutes after arriving on the island, around 11:00AM. This little shelter is where the changing rooms are, and the snorkeling gear is stored. 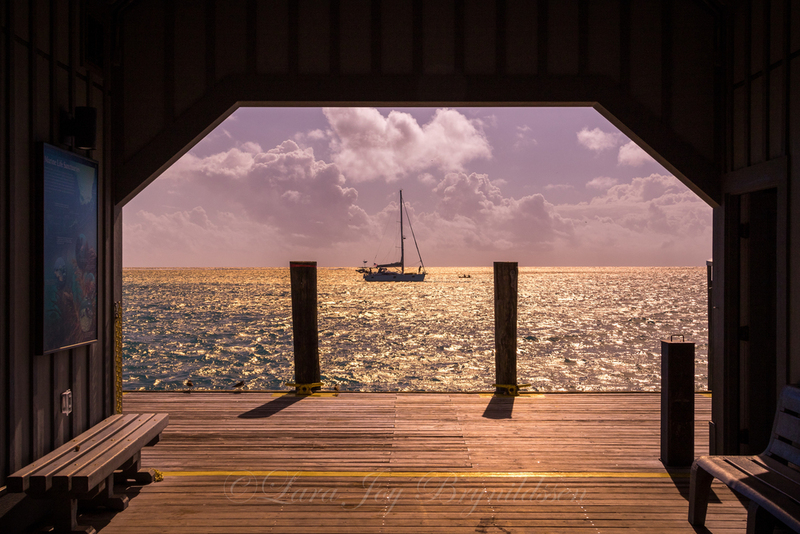 The clouds were beautifully framed by the structure and then the sailboat came into view. I wasn't the only person snapping madly away, trying to get the sailboat perfectly centered but I hope I'm the only one who made it look like it was sunset. It seems a little funny but I did a little "street shooting" while I was on the island too, and of course converted those to black and white. My Gold-n-Blue was still on my lens when I was shooting which actually works great, since it gives your images more depth when you convert to black and white. I probably wasn't subtle about making images of these two but there was a certain calmness in their postures, as they relaxed in the shade and waited for the Fort Jefferson tour to start. I almost felt like they were a couple (they weren't), and I love how the angle of their ball caps creates a unity between the two images. The snorkeling wasn't super, since it was a windy day and the water was cloudy with sand. I paddled about in a shallow section of water for a bit but the best part of the day for me was walking around the moat wall. It was almost like a meditation to walk around the island on the moat wall, and even more so because there just aren't that many people on the island with you. Even 200 people seem to disappear and I was on the moat wall completely alone, looking out at blue sky, puffy white clouds, azure water and the crumbling red brick of the fort. I experimented quite a bit with my camera to get the feel that I wanted in these images. The lead image to this post - one of my favorite from the day - has almost a tilt-shift feel to it, with the tiny people sitting on the moat wall. I was using my 24-105 (which is what I use for 95% of my travel images) but to make the image, I set it directly down on the moat wall, elevating the lens slightly by folding a tee shirt under the hood. The image isn't sharply focused but there's enough depth of field (I think) so that the viewer knows that wasn't an error. And you can see how big the ocean is, and how small we are, and that's just what I wanted. Fort Jefferson is crumbling away bit by bit so don't wait too long to venture to this national park. Bonus image from Islamorada. Because you know I love my iguanas.